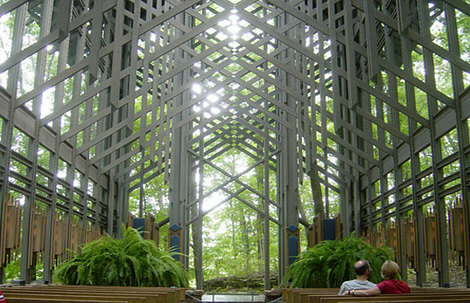 Does Post-Modern Church Architecture Miss The Point? One of the ideas I’ve been thinking about has been Church architecture and stewardship. I adore design and seeing how buildings can make people feel certain ways: a Gothic light-filled cathedral can remind them of the heavens; a simple tent can remind them of the Early Church; an Eastern mosaic-filled curved globe can remind people of the earth, sky and God’s place within it. Recently, though, I’ve thought about how Christian churches can be built upon their stewardship of the Earth, upon their care of the planet and each-other. I’ve been interested in eco- or green-design for a long time as I honestly believe it is one of the best things we can do for the planet. Houses are built in developments all the time, people need houses, but the concrete and cheap materials we use aren’t often anything more than just insulating the problem. If there was a chance of making perfectly good, even great houses, which were carbon-free or as near to it as possible, we could do a lot of good, and educate more people in the process. If Churches were to start thinking about their stewardship too, as well as a few traits of the monastic tradition (like community building, horticulture, raising poultry), it might allow the people within the church more knowledge and wisdom from God. One of the very first things we were told to do was to look after God’s earth and what lived here. I don’t believe we’ve listened to that much, but if designing church buildings could really help people interact with this instruction could there be a happier Christianity? Anyway, these things I’ve been mulling over, along with materials, spaces required (prayer rooms, counselling spaces, etc), blah, blah.. and then I found this article: “Church Architecture for the 21st Century” which although I liked in the main, worried me in some ways. For one, the author automatically claiming the 21st century as a time for post-modern architecture, is something I’m not sure I agree with.. a huge part of me really dislikes the post-modernity spin on the arts and philosophy. The lack of truth concerns me most of all, and although this doesn’t often feature in architecture, it really does have a space in how I view the church. Post-modernity has created some great things, my favourite being eclectic styles of music, but I’m not sure I’d want much of it in my church because the relative attitudes to morality, to truth, would seem so contradictory to the truth that is Jesus Christ. The author’s first commandment is about not creating a space in order to glorify a person, designer, etc and with this I agree. Sometimes we can all too easily fall into hero worship of some leader or writer who comes out with sense. Although we should respect great figures in our society, glorifying them misses the point. We glorify Jesus, our God. That is all. The image he suggests to use instead is a fountain, being “always moving, yet always still” and although I like the image, it could draw dangerously close to naturalism. Once we become more attached to the philosophy of the water than the theology of the cross – we’ve strayed too far. A fountain may have a dual nature but God does not. Although I have often asked people “If you don’t like the music you’re singing to God, why do you think He’ll like it?” and “Why not give Him something you value highly?”, the suggestion to make the experience of church appealing to the senses seemed a little bit people-pleasing. I do believe the church can praise with everything they have, this might include incense, art, music, etc but the aim was always to make praise appealing to God. If people come to church purely for the music, the choir, or the pretty architecture, they have again missed the point. I’m not sure I believe that all Churches should have screens and interactive media. Of course it can be useful, but sometimes the addition of technology can weaken the church not enhance it. One of the saddest church services I ever went to was one in which the band was bigger than the congregation, they played as if it was a gig, and there seemed more emphasis on volume of guitars and pictures on the screen than there was about real worshipful hearts singing to God. In contrast, one of the most holy places I ever worshipped was in a slum where a group of 8 of us, hit metal bins, shoes and the ground whilst creating spontaneous worship. There were no screens, there was barely a wall, but we worshipped God in that place. To suggest the church needs screens to be relavant to this world ignores the fact that a large portion of this world’s population doesn’t even have electricity. The church should be trying to be relevant to the poor, not to the privileged. The author goes on to suggest that the look of the pastor’s study, or Sunday school room, should get a boost of interior design in order to be a healing station for those who come in. In part I agree that the church does need spaces that feel welcoming and inviting, but the constant stream of business language is out of place in a church. I also believe that the room is not the bit that helps, the pastor helps, and with diminishing number of pastors I see this as the more important focus. When the article talks about getting the church out of doors, I hoped he would mean community work, evangelism, etc. Instead, it was more about having a nature-orientated atrium. I love the idea about the church including more of the natural environment, but I would have instead suggested that the church could include spaces open to the community. Vegetable patches could be an encouragement by the church to steward the earth, and share in the meals that the food produces. The last two points I simply feel take the technology too far. Although technology when linked with colour and music can become beautiful pieces, the focus on the experience, and creating that experience, nullifies God’s own action. If we can make people feel like they are experiencing God with music and light and mood changes it seems more manipulative, more deceptive, than glorifying. Imitation might be the highest form of flattery but the last being wanting to take God’s place was Satan – and look how that turned out. We must always be very careful about why we use new technology. Although they have a lot of benefits, we could easily fall into believing the church and the Holy Spirit are things we can create to make us feel better and get too comfortable. Comfort is dangerous in itself. This article fails to see that Christianity was counter-cultural at it’s foundations, and to simply fall into styles of presentation and experience that our Western culture has embraced, misses so much of the Gospel, the teaching of Jesus and of the Early Church. Before, you misunderstand me, I am also not trying to drag the church back into the past. I am instead suggesting that by learning from our mistakes, our past, and our God we can actually do far better than our post-modern equivalents. The Church could fill the gaps which are left behind by the technological form of communication which leaves people lonely. It could use highly symbolic forms of architecture which allowed people to see God in their surroundings, not by spoon-feedings them edited video presentations 24/7, but by allowing God to speak through the building, art forms and music. Sometimes the simplest forms are just a way of humbling ourselves in order to give God more room to work.